Summer activities for kids are key to a smooth, fun and meltdown free (at least mostly) summer. It’s such an exciting time! No matter how young or old your kids are, summer just seems full of endless possibilities. School is out, vacations are happening and schedules are way more lax than usual. That’s why it’s super important to have plenty of cheap and easy summer activities on hand for your kids. Because even though it’s an exciting time of year and there are so many possibilities. The big quantities of unfilled time can be daunting. Sometimes leaving you wondering “how do I entertain my kids in the summer?” Well, I got you boo boo. I’ve put together a list of summer activities for kids of all ages. Ranging from toddler, preschool and on up! Add these activities to your summer bucket list to keep your kids entertained and happy. 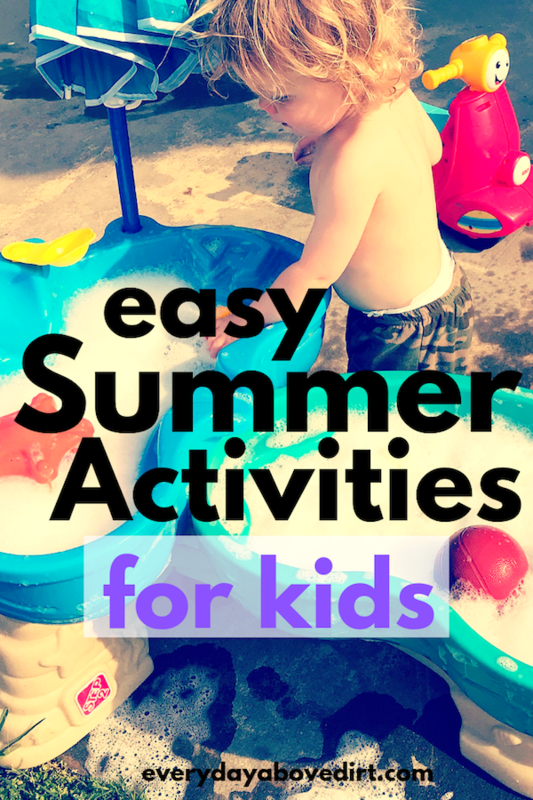 I’m including summer activities you can do at home, on outings and inside. Because variety is the spice (and sanity) of life. And a little side note…If you’re needing more structure in your summer days check out our Toddler Schedule. It has helped keep sanity and structure in our day. Some affiliate links are included at no cost to you. Activities to do during summer vacation don’t have to be extravagant. I’ve found that the little things are usually the ones that make the biggest impact(and fun). I wanted to start with easy activities for kids you can do at home. You’ve probably heard of most of these at some point in your life. But, sometimes we just need a quick reminder. Mom brain anyone?! I first saw these big bubbles when we went to the fair. It’s perfect because it has the awe factor of bubbles and then ups the anti with the gigantic size! You can make the bubbles for your kids if they’re younger or if their a bit older they can do it themselves. This can be as complicated or as basic as you’d like it to be. An added bonus is that it doesn’t really matter how messy it is because you’re outside. We have used flour and construction trucks to create a little outdoor construction zone. Here are 10 more sensory bin options you can try this summer! You know the bath paint that your kids can use in the bathtub? That same paint can be used outside on a Rubbermaid lid or blow up pool. Just a little thing like switching up their canvas can add loads of entertainment. Good ‘ole sprinklers. These bring back memories from my childhood! I especially love this Melissa & Doug Sprinkler. It’s super cute and I love all things Melissa & Doug! Set it up and let your kids run back and forth. We used to put it under our trampoline so the water would squirt through. But, be warned, it gets very slippery! 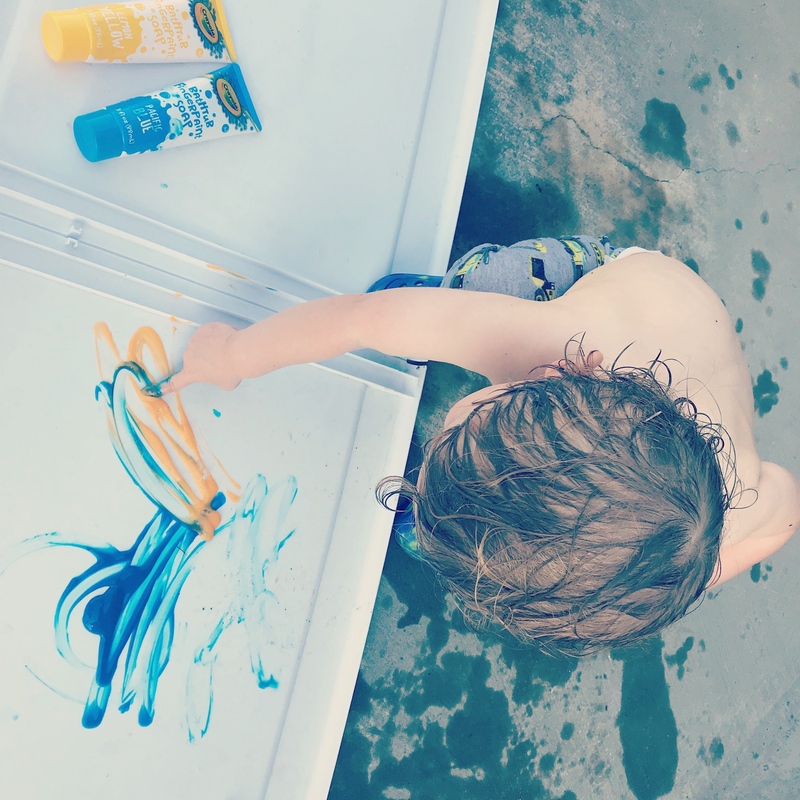 This Crayola Foam Paint is such a fun way for kids to play and create while they are outside. Plus, it disappears with water or time. So, you don’t have to stress when your kids spray it all over themselves, your yard, porch or dog. I like to utilize our outdoor/blow-up pool. Kids can get bored doing the same activity. So, the best way to eliminate boredom is to mix up that same ‘ole activity. The perfect example is this easy pouring station. You just use your outdoor pool and add in some cups, spoons, bowls or whatever container you think your child will enjoy. Then let them transfer water back and forth between all the containers. I know, bugs are gross! But, your kids most likely love them. Encouraging bug exploration is a great way to foster the creativity and curiosity that is within your child. Find an old rubbermaid container and punch holes in the lid. Or, here is a critter case if you want a fancier option. Then take your kids on a bug hunt where they can collect different bugs they find. If you want to take it a step further you can then Google the bugs to discover what they are. You can also count legs, arms, eyes and talk about wether they fly or crawl. There are tons of ways to extend this activity. Another educational activity you can do outdoors is simple chalk art. I like to write the alphabet then ask my son to jump on a certain letter. We do the same things with numbers, shapes and names of people in our family. You can mix it up by asking them to sit, stomp, high five, karate kick or doing jumping jacks on the object you want them to find. Bring some old sheets, blankets and towels outside. Tell your kids that they get to make a fort. You may need to get the ball rolling by giving them ideas or they may just take the material and run! If you need to help them show them how they can use the lawn furniture to drape the sheets to create a roof or walls. This activity has the potential to take thirty minutes to an hour! Get your self a lemonade and do some sun bathing! The bubble water table has saved us on many hot days. Instead of just putting water in your water table you add some dish soap first. Then turn on the hose and get the bubbles going! Before long the bubbles will be overflowing. This adds a whole new texture and dimension to their normal water play. If you don’t have a water table, no worries. Just use a blow up pool or a big container. Both will work perfectly! We are fans of camping but when you have kids backyard camping is the way to go. Because having a bathroom and snacks near by are always a good thing! If you have a tent pop that sucker up and tell your children that they get to go camping in the backyard! You can also tell them that they need to gather all the materials for camping like water, food, sleeping bags and whatever else they thing necessary. This will most likely create a bit of a mess but it encourages responsibility and creativity! This is one we do all the time and it’s always a win! You’re going to eat lunch anyways but now you can spice it up by throwing in a picnic blanket and eating outside. Who doesn’t love ice cream during the hot summer months?! Now you can involve your kids and make your own ice cream! This Homemade Vanilla Ice Cream is so easy and can be made in 5 minutes. Plus, you don’t need an ice cream maker to do it! I’m all about easy and cheap. That’s why this activity is the best! Blow up a ballon, cut a swim noodle in half. Then have the kids hit the balloon back and forth with the noodles. So much fun and so little time and money spent. I’m sure a Gladiator pool noodle battle will break out at some point, so just prepare yourself. We’re all about making kites around here. They rarely fly but it’s still fun to drag them across the back yard and pretend (haha). If you want to get more serious about making a kite. Here are is a video on how to make legit kite in 2 minutes. But, if you don’t have time and would rather buy a kite. Here is a great, inexpensive option on Amazon. Sometimes you just need to get out of the house for some summer activities for kids. In this section I’ll include kid activities that you can do on outings outside. Where we live there is a local splash pad that is free to the community. Hopefully you have one of those too! But, if not, the YMCA usually has some sort of splash pad option. Hiking has been a great outlet for us. It’s a great way to get out of the house. Get some fresh air and just change the scenery. It’s also a great way to expel some energy and get excercise. With a little Google research I’m sure you could find a hiking trail near you. A rather obvious option but still worth talking about. The pool can be a great outlet for the whole family. We plan to get a peddle jumper like this for this summer season so I don’t have to stress every second that we are at the pool. I included this in that “at home” section, but a picnic is also perfect for an outing. You can visit a local park or just an empty field. Then some summer days it’s just too hot to be outside. That’s why I wanted to share some easy indoor summer activities that will keep you cool and won’t break your budget. The Library is always a good free option. There’s usually a small play table in the kid area plus some computers if you want technology time. Checking out books is a great way to take some more entertainment home! AMC is offering a Summer Camp (of sorts). It included a kid friendly move plus a KidsPack for $4 every Wednesday. You can find your local theater times here. Your local science museum is good way to give variety to your schedule. When you’ve gone to the pool a million times and you can’t do another outdoor activity. Let the science museum take over. There are so many educational outlets to museums. And did I mention you won’t be outside. Here I have listed a slew of activities that are easy, educational and indoors. You can do them at home with very little prep. I know it’s basic, but it’s also fun! It’s like a free version of the zoo. We have seen mice, lizards, parrots, snakes, cats and more. It’ll give you at least 20 minutes of indoor entertainment. I love this option! When the summer heat gets to everyone it’s time to take the focus off of their discomfort and focus on how they can be kind to others. These activity cards are full of ideas on how to get your kids thinking about being kind to others. Along the same lines as the Pet Store. Any adventure is what you make it. 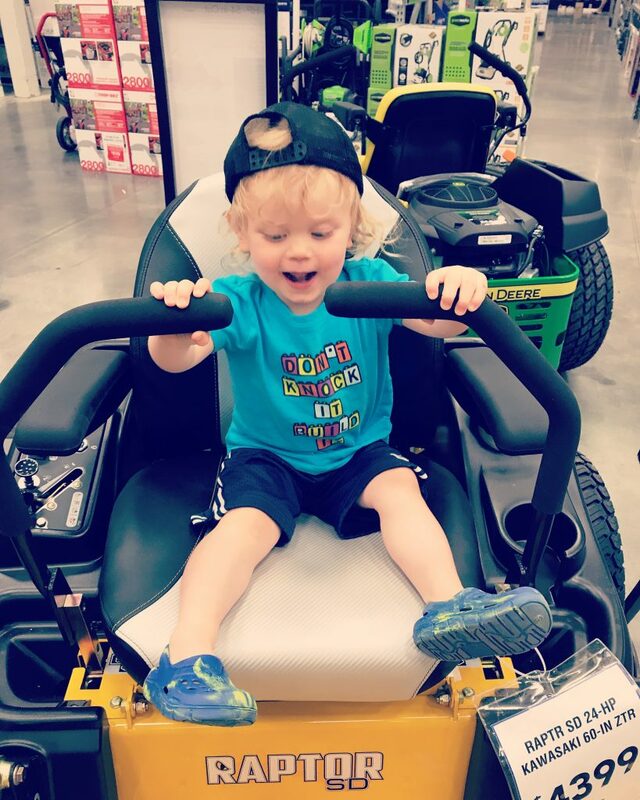 We have a blast at these stores testing out the riding lawn mowers and seeing if the blinds function properly. When the heat gets too hot. It’s time to check out some tools. If you’re looking for summer activities near you. 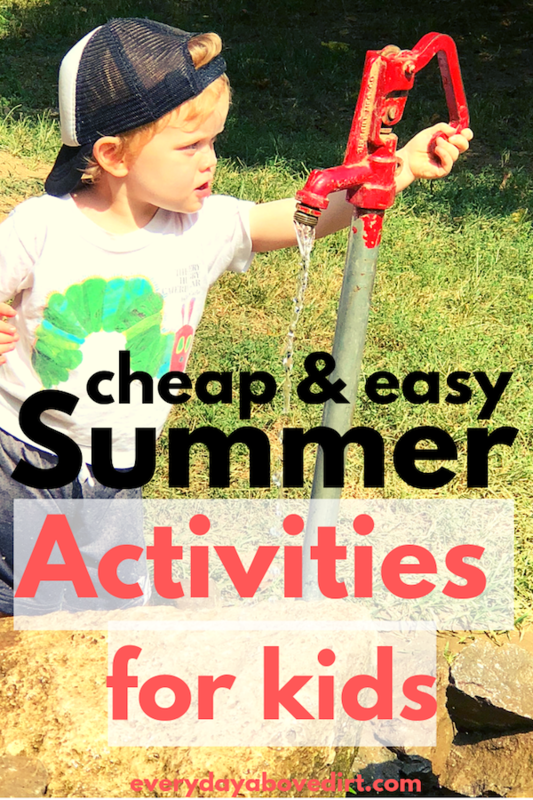 These two resources are a great way to find inexpensive summer activities. I sincerely hope these ideas help you have a stress free, enjoyable summer! If you have some additional summer activity ideas please feel free to leave them in the comments! Let’s help each other out. Here’s to a great summer mama!